*******(Admission Tax of 9% is included in ticket price)******* 3 hour premium open bar from 9pm to Midnight. Champagne toast at midnight. Access to both rooms. Open Bar wristbands may be picked up at Will Call. Must present proof of purchase. Will call is open 5pm to 10pm on December 30th, 2018 and Noon to 7pm on December 31st, 2018. (HIGHLY RECOMMENDED TO HELP EXPEDITE ENTRY) - ALL SALES ARE FINAL. NO REFUNDS. Individual reserved bar seating with complimentary admission and 3 hour premium open bar from 9pm to Midnight. Champagne toast at midnight. Access to both rooms. Open Bar wristbands MUST be picked up at Will Call. Must present proof of purchase. Will call is open 3pm to 10pm on December 30th, 2018 and Noon to 7pm on December 31st, 2018. (EARLY ARRIVAL HIGHLY RECOMMENDED TO HELP EXPEDITE ENTRY) - ALL SALES ARE FINAL. NO REFUNDS. Includes VIP Table and complimentary admission for 2 guests with 1 Belvedere Vodka - NO REFUNDS. ALL SALES ARE FINAL - 3 hour open bar is NOT included in any VIP table package. Tax and gratuity is not included in price. 34.95% will be collected night of, by your cocktail waitress at your table. This table is located at Beer Park. Includes VIP Table and complimentary admission for 5 guests, 1 Belvedere Vodka & 1 Moet Champagne - NO REFUNDS. ALL SALES ARE FINAL - 3 hour open bar is NOT included in any VIP table package. Tax and gratuity is not included in price. 34.95% will be collected night of, by your cocktail waitress at your table. Includes VIP Table and complimentary admission for 4 guests, 1 Belvedere Vodka & 1 Moet Champagne - NO REFUNDS. ALL SALES ARE FINAL - 3 hour open bar is NOT included in any VIP table package. Tax and gratuity is not included in price. 34.95% will be collected night of, by your cocktail waitress at your table. Includes VIP Table and complimentary admission for 6 guests, 2 Belvedere Vodka & 1 Moet Champagne - NO REFUNDS. ALL SALES ARE FINAL - 3 hour open bar is NOT included in any VIP table package. Tax and gratuity is not included in price. 34.95% will be collected night of, by your cocktail waitress at your table. Includes VIP Table and complimentary admission for 8 guests, 2 Belvedere Vodka & 2 Moet Champagne - NO REFUNDS. ALL SALES ARE FINAL - 3 hour open bar is NOT included in any VIP table package. Tax and gratuity is not included in price. 34.95% will be collected night of, by your cocktail waitress at your table. THIS TABLE OVERLOOKS THE LAS VEGAS STRIP. Includes VIP Table and complimentary admission for 8 guests, 2 Belvedere Vodka & 2 Moet Champagne - NO REFUNDS. ALL SALES ARE FINAL - 3 hour open bar is NOT included in any VIP table package. Tax and gratuity is not included in price. 34.95% will be collected night of, by your cocktail waitress at your table. Includes VIP Table and complimentary admission for 8 guests, 3 Belvedere Vodka & 1 Dom Perignon Champagne - NO REFUNDS. ALL SALES ARE FINAL - 3 hour open bar is NOT included in any VIP table package. Tax and gratuity is not included in price. 34.95% will be collected night of, by your cocktail waitress at your table. Includes VIP Table and complimentary admission for 10 guests, 3 Belvedere Vodka & 2 Dom Perignon Champagne - NO REFUNDS. ALL SALES ARE FINAL - 3 hour open bar is NOT included in any VIP table package. Tax and gratuity is not included in price. 34.95% will be collected night of, by your cocktail waitress at your table. Includes VIP Table for and complimentary admission 10 guests, 3 Belvedere Vodka & 2 Dom Perignon Champagne - NO REFUNDS. ALL SALES ARE FINAL - 3 hour open bar is NOT included in any VIP table package. Tax and gratuity is not included in price. 34.95% will be collected night of, by your cocktail waitress at your table. Business casual/professional attire preferred. No shorts, flip flops, hats, sports attire, Timberland style boots, excessively baggy clothes, or large chains will be admitted. Large handbags and electronic vapor cigarettes are not allowed. Ticket holder must arrive prior to MIDNIGHT 12:00am or entry will not be guaranteed. All patrons must be 21 years of age with valid ID. US residents must bring state or federal issued ID. Foreign residents must have passports. No copies or paper ID's will be accepted. Proper Nightlife Attire Required. The door and management reserve all rights to decline entry of any guest not in proper dress code. Chateau Nightclub reserves the right to decline entry due to capacity issues, guests will be asked to wait until doors re-open.F Visibly intoxicated guests will not be admitted to the venue. Chateau Nightclub is a 21+ venue, no minors will be admitted. Any disregard of the previously stated rules will invalidate your ticket / entry. 3 hour open bar is not included in any VIP table package. All items, tickets, tables & packages are non-refundable under any circumstances. All sales are FINAL. No Refunds. All items, tickets, tables & packages are non-refundable under any circumstances, including cancellations. All sales are FINAL. No Refunds. Items in your order may not be transferred. Cardholder must be present to redeem. You must be 21 years of age or older with a valid U.S. State issued identification or passport. 2 great outdoor venues, 1 HUGE party!! Ring-in the New Year under the iconic Eiffel Tower replica in Vegas in an open-air environment. Sip some bubbly with a full panoramic view of the Las Vegas Strip and famous Bellagio fountains. Guests with individual open-bar package with midnight champagne toast or VIP packages featuring Belvedere vodka and Moët champagne can toast to the New Year and enjoy spectacular fireworks. (Heaters provided for all outside areas - Coat Check available) (Access to all rooms does not guarantee access to rooftop if capacity is met). Disclaimer: EARLY ARRIVAL RECOMMENDED. Ticket holder must arrive prior to MIDNIGHT 12:00am or entry will not be guaranteed. All patrons must be 21 years of age with valid ID. US residents must bring state or federal issued ID. Foreign residents must have passports. No copies or paper ID's will be accepted. Proper Nightlife Attire Required. The door and management reserve all rights to decline entry of any guest not in proper dress code. Chateau Nightclub reserves the right to decline entry due to capacity issues, guests will be asked to wait until doors re-open. Visibly intoxicated guests will not be admitted to the venue. 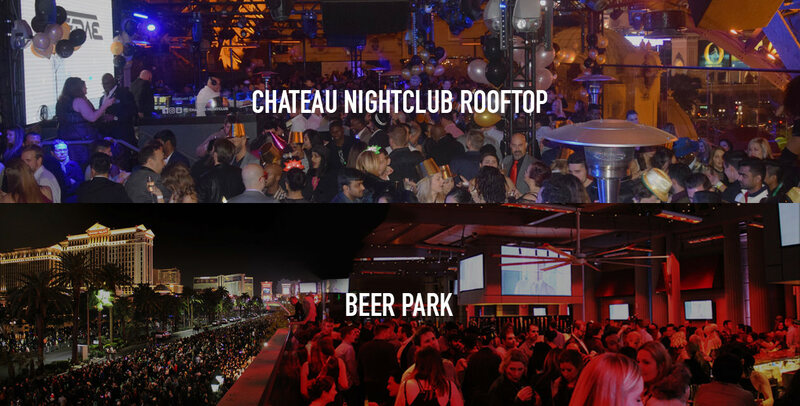 Chateau Nightclub and Beer Park are 21+ venues, no minors will be admitted. Any disregard of the previously stated rules will invalidate your ticket / entry. 3 hour open bar is not included in any VIP table package.